Building a desired house in a location of preference appears to be more and more cumbersome for some as the years go by and for others, they do not have the time to see to a building project. Having studied our environment as well as our behaviors as individuals, we decided to bridge the gap between You and Your Dream Home.My House Project is an iconic tailored real estate innovation for you. * Are you gainfully employed or own a good business? 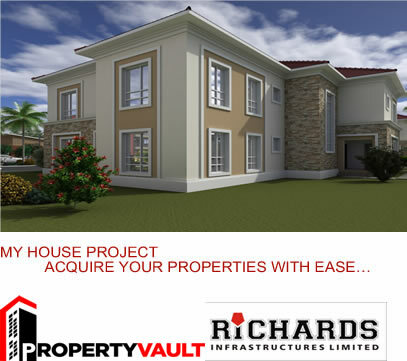 * Have you built a house to accommodate your household in Lagos, Abuja and Portharcourt? * Do you want to build houses to increase your assets/wealth? * Do you want to build and sell properties as a part time business? * Will you be able to summon 30% of the total cost of development of your desired property? Do you have a land with good title without required cash to construct the desired house? * Do you have the time for seeking approvals and managing contractors while running the days job? * Have you bothered to visit the bank for construction loans? Then let me tell you, PropertyVault limited has introduced a friendly partnership program to suit your pocket and busy schedule. Tell us your area of interest and budget and we will acquire a good land for you Or Give us your land with good title and we will give you a good design as well as process your building approval. Do your construction based on a mutually agreed BOQ. Above all provide construction finance to the tune of 70% of the project cost payable in 1year. We guarantee conversion of the construction finance to 10years mortgage if your cash flow can accommodate such. 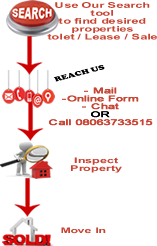 For intending traders, we will easily market the property at the prevailing market rate. Wondering how?